Parents team dinners plan 5:15 not 5, thank you again! For the second game in a row the Lady Titans posted a shutout. Gabby Segura and her stingy defense held the West Panthers to only two shots on goal. On the other side of the field, the offense put the pressure on the Panthers goalkeeper. A lot of credit goes to the opposing keeper as she fended off shot after shot. Overall the Titans out-shot the Panthers 27-2, but had a difficult time finding the net. After a scoreless first half, Syracuse finally got things going as Kylie Harris finished off assists by Kyra Tolbert, Savannah Allen, and Kylie Johnson. These three assists helped Kylie record the first hat trick in school history. Next up for the Titans is another home game against a tough Layton team on Tuesday at 3:30 pm. The team walked onto the Vikings home field as underdogs, but walked off with the 1-0 win. Viewmont came into the game sporting a 5-0 record and #2 state ranking. The game was evenly matched with both teams fighting into halftime 0-0. The second half was equally well matched, but eventually Kylie Harris scored her 4th goal on the season. Aleeah Martinez got the assist. The team has come a long way in the last few weeks and continues to get better everytime they take the field. This was a big victory for the Titans, but merely a stepping stone to where we ultimately want to take this program. Next up for the Titans is a home game against West on Thursday at 3:30 pm. Bus rides, chick flicks, hot weather, and well played soccer all made the soccer team’s trip to St. George challenging but awesome. The varsity team nearly came home with two victory’s against a pair of solid 3A schools. Wednesday night, a battle to the end secured a 2-1 victory over 2014 3A state runner-ups Desert Hills. The Thunder had the Titans on the ropes late in the second half, but the defense didn’t break and were able to hold on for the win. KJ and Harris were at it again as they both scored their third goals of the season. 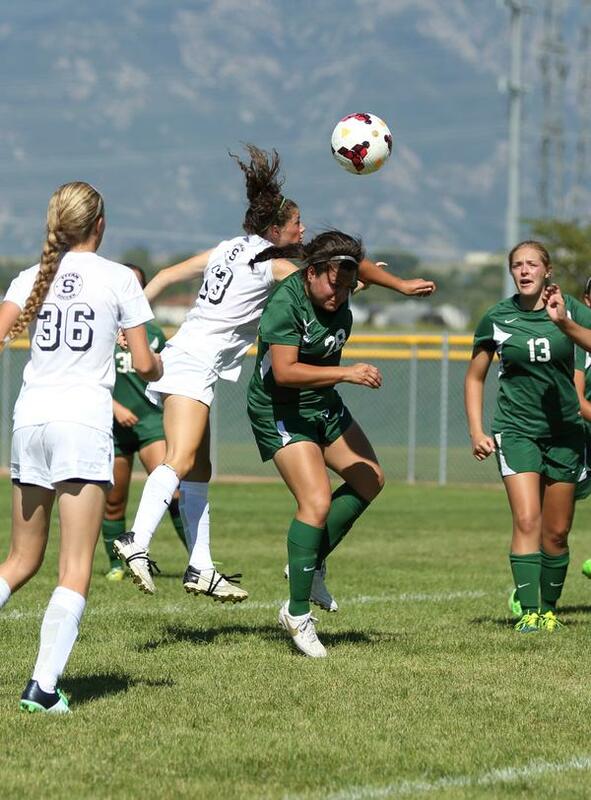 On Thursday, the team battled to a 1-1 draw against the Snow Canyon Warriors. Kyra Tolbert got the goal in the first half. The Warriors capitalized on their only second half opportunity and held on for dear life the rest of the game. Syracuse controlled the second half and had quite a few opportunities, but just couldn’t fine the back of the net. The girls had a great time hanging out, traveling, and competing together. The Juniors and Sophomores won an epic battle of steal the flag before heading home Friday morning. The team will begin region play on Tuesday against Viewmont (3:30 pm at VHS) as they begin their quest to become only the second Syracuse squad to make the playoffs. The girls came out strong and controlled the game early against the Provo Bulldogs. The girls had a hard time finding the net in the early goings, and #11 Kristino Otterstrom from Provo patiently waited for her chance to strike. Twice in fact, within 3 minutes of each other. Suddenly down 2-0, Kylie Harris entered the game and gave the team a spark after creating and scoring on a penalty kick. Down 2-1 at half time, the team responded perfectly to the coaching feedback. The girls struck early and often in the second half, with another goal from Kylie Harris, a goal by Priscilla Meza, and 2 goals from Kylie Johnson. Down 5-2, Provo’s Kristino Otterstrom wasn’t done scoring. She struck twice more to finish the game with 4 goals. Fortunatey, Myka Bouwhius sandwiched a goal of her own in between Otterstrom’s last two goals. Ending the game 6-4 left the girls with mixed emotions. Proud that we overcame some early adversity, dissapointed that some repeat mistakes are ending in goals against. Fixable mistakes, with 2 more games to figure it out down in St. George next week against Desert Hill (Wed.) and Snow Canyon (Thurs.) before region play. The Titans opened the 2015 season with a hard fought 4-2 loss to the Bonneville Lakers. The Titans started the scoring off with a great free kick by Madi Wilcox and an outstanding header over a leaping Bonneville keeper by Myka Bouwhuis. The Lakers’ #9 evened the score in the 17th minute. T he teams went into halftime tied 1-1. The Lakers #9 struck again with her second goal in the 41st minute. The Lakers found the net again just 3 minutes later and went up 3-1. The Titans battled to the end, adding a goal in the 78th minute with a goal from Taya Tobler. Down 3-2 with short time, the Lakers added another goal to put the game away and take a 4-2 victory on the road.